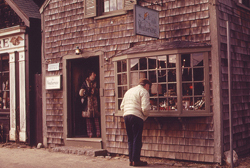 Sunday tourists at the Weathervane Pewter Shop, Rockport, Massachusetts, 1973. How Are Digital Technologies Changing Our Views of the Past? While 3D visualizations, complex databases, interactive websites, social media, and Geographical Information Systems allow us to model, record, analyze, disseminate, map, and interpret information about cultural heritage, they are also profoundly transforming our views of the past. Major questions about the past have long been studied through chronology, typology, space, and narrative. But are digital technologies creating a new means of envisioning past cultures, eras, and landscapes in a virtual, non-narrative immediacy? What implications does that have for historiographical representation? What role do they play in complicating or simplifying the stewardship of historic resources? How do they enhance or trivialize the public interpretation of sites and monuments for the purposes of cultural tourism? Abstracts will be accepted through February 1, 2012. Selected papers will be published in Heritage & Society, a peer-reviewed journal, whose editorship has been assumed by the UMass Amherst Center for Heritage and Society. Maurizio Forte, "The Past in the 'Clouds': Dreams and Nightmares of Virtual Heritage"
Dr. Maurizio Forte is full professor of World Heritage at the University of California, Merced. He was director of Virtual Heritage and Senior Researcher at the Italian National Research Council. He has coordinated research and fieldwork projects in Italy, India, Turkey Ethiopia, Egypt, Syria, Kazakhstan, Peru, China, Oman, USA and Mexico. He created the first virtual collaborative museums in Europe with the Digital Scrovegni Chapel Project (Padova) and the Virtual Via Flaminia Project (Rome). He is editor and author of several books including Virtual Archaeology, Virtual Reality in Archaeology, and 200 scientific papers. He achieved several international awards: Best paper awards VSMM 2002, 2008, 2010. E-content, E-culture Award 2005-2008; 2009 Tartessos Prize. Francis P. McManamon, "Archaeological Information: Access, Preservation, and Use in the 21st Century"
Dr. Francis P. McManamon is the Executive Director of the Center for Digital Antiquity, an organization devoted to broadening and improving the ease of access to archaeological information and to the long-term preservation of archaeological information. He also is a Research Professor in the School of Human Evolution and Social Change at Arizona State University. Prior to joining Digital Antiquity, McManamon served as the Chief Archeologist of the National Park Service and the Departmental Consulting Archeologist of the U.S. Department of the Interior. He has authored many articles on a variety of topics related to American archaeology. Most recently, he is the general editor of a 4-volume encyclopedia, Archaeology in America (2009), which was named as an outstanding reference work by the American Library Association in 2010. Maria Roussou, "Designing User-centered Digital Heritage Experiences Based on Personalized Interaction and Storytelling"
Dr. Maria Roussou is Founding Director of makebelieve design & consulting, as well as a researcher and Adjunct Lecturer at the University of Athens, Greece, teaching courses on Museums and Digital Technologies and Human Computer Interaction. Previously (1998-2002), she established and directed the Virtual Reality Department at the Foundation of the Hellenic World in Athens. She holds a PhD in Computer Science from the University of London, UK, a MFA degree in Electronic Visualization and a MSc in Computer Science from the University of Illinois at Chicago.